A beautiful tree-line lane leads to the quiet Boréalis community. 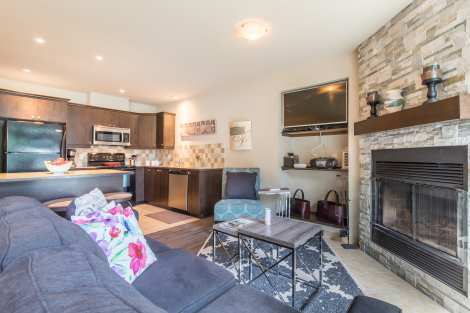 Nestled at the heart of the prestigious Le Diable golf course, these country-style townhomes are surrounded by hectares of rolling greens in a landscape that is both peaceful and majestic. Heaven for golfers, cyclists and sports enthusiasts, this community is ideally situated. In winter, cross-country ski and snowshoe trails crisscross the immediate area. In summer, Boréalis boasts one of the largest outdoor pools in the region, to the delight of young and old. Several kilometres of walking and bicycle trails are right outside the door. A shuttle runs between the residences and the pedestrian village at the foot of the mountain. And last but not least, each residence includes a private garage. To choose Boréalis is to opt for utmost comfort and luxury at a reasonable price. Cozy townhome with refined décor. 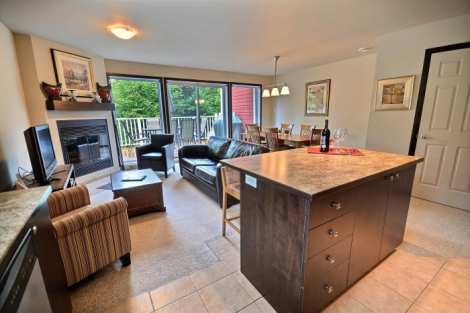 Whether you are an avid golfer or cyclist or simply want to get away, this vacation home has everything you need for a pleasant, hassle-free stay. The private garage has plenty of room for all your sports equipment. The modern and functional kitchen has everything needed to prepare great meals. 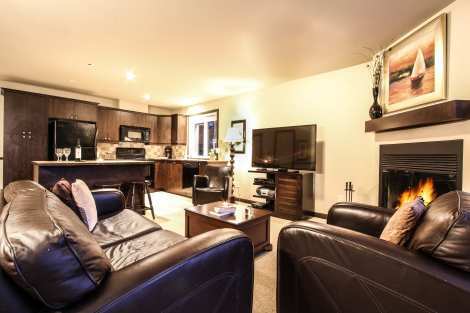 The cozy living room is furnished with leather sofas and an HDTV. A generous window arrangement and a glass door brighten this open-concept living area. Gather around a crackling fire in the wood-burning fireplace after a day filled with outdoor activities. The bedrooms are on the second floor. The master bedroom, with king-size bed, features a high-definition TV with cable and an adjacent full bath. The guest room has a queen-size bed and high-definition TV with cable. The third bedroom contains two single beds. In summer, we like the air conditioning and lovely balcony with barbecue. Spacious vacation home that can comfortably accommodate six people. There is plenty of room for everyone in this modern, well-designed space. The main room features a wood-burning fireplace, large windows and a glass door that opens onto a balcony with forest view. The kitchen is a pleasant and functional space for meal preparation. A large dining table invites guests to linger over a good meal and chat about the day's adventures. The bedrooms are on the second floor. The master bedroom has a cozy king-size bed and a full bathroom. The second bedroom with queen-size bed and the third bedroom with two single beds share a full bathroom. The private garage offers additional storage for sports equipment. The unit has partial air conditioning, two TVs with cable and wireless access to high-speed internet.